Throw your weight behind us in 2017. Support us through our parent organization, the Free Software Foundation, with a $25 donation or a membership with perks for only $10/month. We are regular agitators at the US Copyright Office, which directs enforcement of the laws protecting DRM from weakening or circumvention by the public. This year, the Office relaxed its stance and started soliciting public feedback on DRM laws (read what we told them). Later, the Office enacted a loosening of restrictions we helped win, giving security researchers, archivists and tinkerers some room to breathe. Change in the US may mean change around the world in 2017, but it will require renewed pressure from us to prevent backsliding under the new administration. We've significantly slowed the progress of DRM at the World Wide Web Consortium, where companies have been trying to win DRM a blessing as an official component of the Web. We organized users to protest in-person at the Consortium, to insist that DRM is incompatible with a free Web. Many organizations inside the Consortium agree with us, and they are leading an internal resistance movement. DRM standardization processes often fizzle out if they lose momentum; if we can keep up the same amount of pressure for another year, we have a chance to win by attrition. 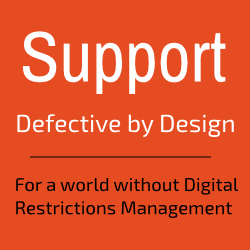 For more about Defective by Design's work, see our recent posts, Guide to DRM-free Living, and DRM FAQ. Defective by Design is fully funded by the nonprofit Free Software Foundation (FSF), which has defended computer users' rights for more than 30 years. We are at a tipping point in the struggle to end DRM. To make the most of it in 2017, we need to help the FSF reach its goal of raising $450,000 by December 31st. There are two ways you can help us meet this goal: make a one-time gift to the FSF, or support our work year-round with an associate membership. Memberships start at $10/month ($5 for students) and include member benefits. We are grateful to everyone who has supported Defective by Design through this year of breakthroughs. We look forward to doing more for you--and racking up more victories against DRM--in 2017.